Foster-Taylor is the nation’s oldest distributor of fireplaces by Lennox/Superior, the number one fireplace manufacturer in America. Locally owned and family operated, Foster-Taylor shares facilities in New Orleans and in Mandeville with Masonry Products Sales, its sister company. Foster-Taylor was established in 1983 to sell and install prefabricated fireplaces primarily in new construction. In the 30 years since, Foster-Taylor is now recognized nationally as one the strongest and most respected fireplace distributors in the country, serving both homeowners and the trades. We inventory the majority of the products we sell and our installations are performed by our staff of full-time installers in company trucks. Our in-house service technicians are available for service during and after the warranty period. We are fully insured and members of the Better Business Bureau. In addition to fireplaces and accessories, the company supplies gas logs and custom-made cast stone mantels and surrounds. For over 40 years, our goal has been to ensure the complete satisfaction of our customers, while offering knowledgeable and friendly service at competitive rates. We know that you have a choice of fireplace shops in the area and we appreciate your consideration. Our hope is that you'll feel confident in our ability to meet all of your expectations and know that our customers are always our number one focus. Established in 1973, we have gained the experience of being able to provide nearly any type of fireplace and accessories that you require. However, if you don't see exactly what you're looking for here, please contact us and we will do everything we can to satisfy your needs. What should you know about buying a fireplace in Saint Benedict? Since wood smoke contributes to air pollution, many cities have banned the use of wood-burning units. If you’d like to buy a wood burning unit, check the Saint Benedict, LA city policies first. If your home already has a wood-burning unit that you’re concerned about, contact a fireplace manufacturer to replace your wood-burning unit with an environmentally friendly electric or gas alternative. Gas inserts can be efficient heaters and may lower your electric-heat bill. Many adjust to provide high heat on a cold night or a low-burning flame for ambience. Interior fireplaces and mantel designs are as varied as home interiors. 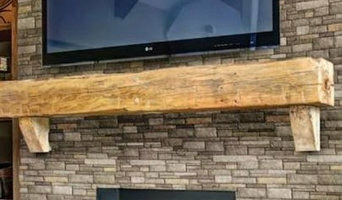 From custom fireplace mantels made to conceal a flat-screen TV to custom hearth designs with elaborate Renaissance-style stone mantels, the latest designs can be found by visiting Saint Benedict, LA fireplace showrooms. Find fireplace manufacturers and showrooms, plus fireplace installation professionals, on Houzz. Go to the Professionals section to find Saint Benedict, LA fireplace design and installation experts.